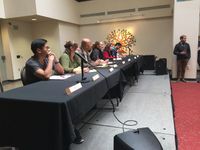 Dozens of University of New Mexico students voiced their opinions on where they believe student fee dollars should be spent next academic year. The Student Fee Review Board (SFRB) held two open forums to give both undergraduate and graduate Lobos the chance to tell the board how they want the money allocated before the SFRB makes its final decision in late October. The board received funding requests from more than two dozen different programs and organizations at UNM, totaling more than $19 million. At the forums, students from a variety of campus organizations came forward to express the importance of their respective programs and explain why the review board should fund them. Students shared personal stories about the Women’s Resource Center, African American Student Services, Community Engagement Center, El Centro, and many more. “The Student Fee Review Board would like to thank all the students who came to the student fora events and contacted us with their feedback. We appreciate you sharing your personal stories, and how all the different units have impacted your success at UNM,” said Martin. The Student Fee Review Board will submit its recommendations to the Board of Regents for final approval. If you were unable to attend the forums, you can email the board at SFRB@unm.edu.